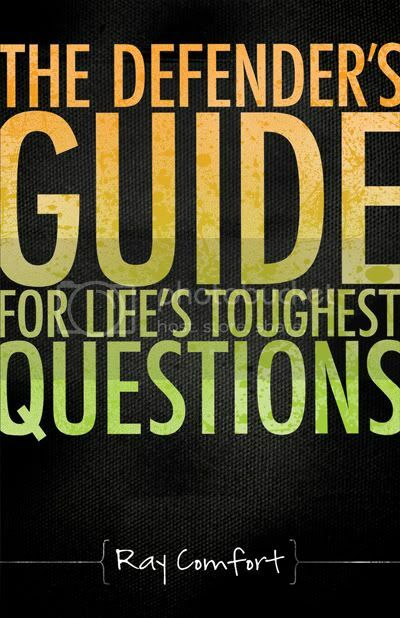 A fairly short book (176 pages), I thought that The Defender's Guide for Life's Toughest Questions by Ray Comfort would be something I could read through in a couple of days and get a review turned out fairly quickly. Instead, I've had it in my hands for just over two months. Obviously, for me, it hasn't been an easy read. But that doesn't describe it well either. I guess it is just that I needed to think about what I was reading, so I didn't go reading large chunks at a time. And life has been busy. I was not familiar with Ray Comfort. Apparently, he co-hosts a televsion show with Kirk Cameron and is fairly well known for debating atheists. That comes through in this book. It's tough to be a believer in today's world- especially if you are a student in an academic system intent on destroying your faith. Bestselling author and television co-host, Ray Comfort, has collected some of the toughest questions people will face in defending their faith and offers sound biblical responses. Each issue is one that has been raised by genuine atheists. Don't be without these powerful facts when you face a world trying to twist and confuse biblical truth. When an atheist wants an answer, will you have one? Any Christians out there want to take on why the Bible has such a low opinion of women? What is wrong with using 'filthy language'? Biblically or otherwise? Do you really believe the Holocaust was God's punishment of the Jews? Ray Comfort tackles these questions and many more in The Defender's Guide for Life's Toughest Questions. Learn how to approach these types of questions with confidence, biblical truth, and loving kindness! Comfort does address a number of questions that many people would shy away from. Although I didn't always agree with his answers (not that I exactly disagreed either), he really did give me a lot to think about. And maybe something to say when I'm confronted with questions. One section I did really like had to do with the topic of prayer. The "question" (actually a statement in this case) was "I've tried praying, and it doesn't work!" Ray talks about a couple of things in response, getting into understanding the will of God. He talks about two types -- the permissive will, and the perfect will. The first part, though, addresses the idea that God does answer prayer. One part I really liked: "So stop clicking your fingers and expecting God to come running like some sort of divine butler. It doesn't work that way." God does answer. It just isn't always "yes." I love the wide variety of questions. I love the well thought-out answers. I mostly liked his fairly blunt style. Hmmm... I didn't request this book , and I had no idea who Ray Comfort is either. Good review though. I love the prayer quote. I need to start quoting books more.